Watch these two videos. The first is an anti-gun ad by Bloomberg’s anti-gun group, Everytown for Gun Safety. It shows how anti-gun people view the world. The second is an ad for Glock inc. It shows how pro-gun people see the world. I saw these two videos when I read an article titled, New Bloomberg Anti-Gun Ad Inadvertently Proves Why Women Need Guns, by Katie Pavlich. 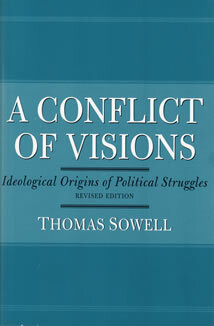 It got me thinking about Thomas Sowell’s book titled, A Conflict of Visions. In it he says, “One of the curious things about political opinions is how often the same people line up on opposite sides of different issues“. The people on each side of the gun issue are most probably on opposite sides of other issues, like the death penalty, abortion, welfare, monetary policy, economics, the role of Government etc. The reason is each side has a different vision of how the world works. These different visions make people talk past each other when discussing different issues. For the most part both sides probably want similar outcomes on many of these issues, unfortunately they have no common ideological road to travel, in order to logically reach a common end. It’s like trying to give someone directions on how to get to Chicago from New York, which is where you live, unfortunately they live in Denver. The directions would make no sense. This is the problem we all have when we discuss issues with other people. When talking to people, ask yourself: Where am I? Where are they? Do we have the same end in mind? Can we find common ground from which to start? Am I wasting my time? Dr. Sowell calls these two competing ideologies the constrained and unconstrained visions about the nature of man. The constrained vision sees man as inherently self-interested and morally limited. Instead of trying to change human nature, which is impossible if not cost prohibitive, people with the constrained vision want to produce the best possible outcome inside of these constraints. Incentives matter in the constrained vision. Dr. Sowell quotes Alexander Hamilton from The Federalist Papers: “It is the lot of all human institutions, even those of the most perfect kind, to have defects as well as excellencies- ill as well as good propensities. This results from the imperfection of the Institutor, Man“. In the case of anti-gun and pro-gun, the differing visions is simple to explain. One side thinks the gun entices people to use it to harm another person. If it wasn’t for the gun this temptation wouldn’t exist. The other side believes evil people exist and they can be deterred or stopped by another person possessing a gun. The side of the gun debate you’re on probably depends on your vision of the nature of man. Dr. Sowell tries to answer the question of which vision is valid in two other books, The Vision Of The Anointed, and The Quest For Cosmic Justice. This video was made before the 2008 election. It is eerie how Dr. Sowell’s analysis was like a warning bell. Related Article – Thomas Sowell’s Vision of the Anointed, at austrianaddict.com. Related Article – Thomas Sowell Explains How Democracy And Freedom Are Not The Same Thing, at austrianaddict.com.